One of the ways in which a designer can instruct his weavers is to have his design transferred onto squared paper on which one square of the chart represents one knot (this is known as a cartoon). It requires little effort from the weavers to use a cartoon because they simply weave exactly what they see on the chart. Cartoons can be large and if the pattern does not repeat, they can be almost life-size. 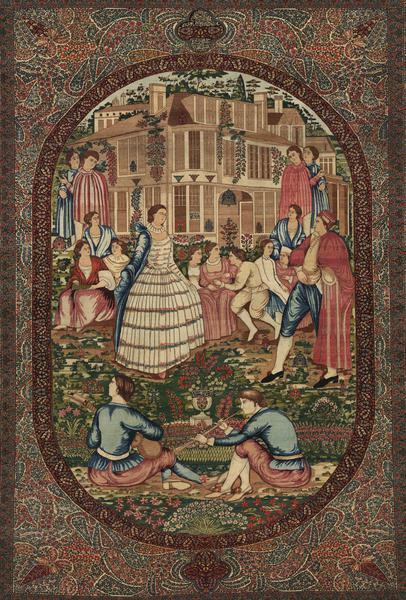 Since the late nineteenth century this has been the most common way to communicate a complex design to weavers but even using computer technology, skilled draughtsmen are needed to translate the designer's ideas into usable cartoons and, unless the carpet is a special and expensive commission, many carpets have to be woven from one design to cover the costs involved. 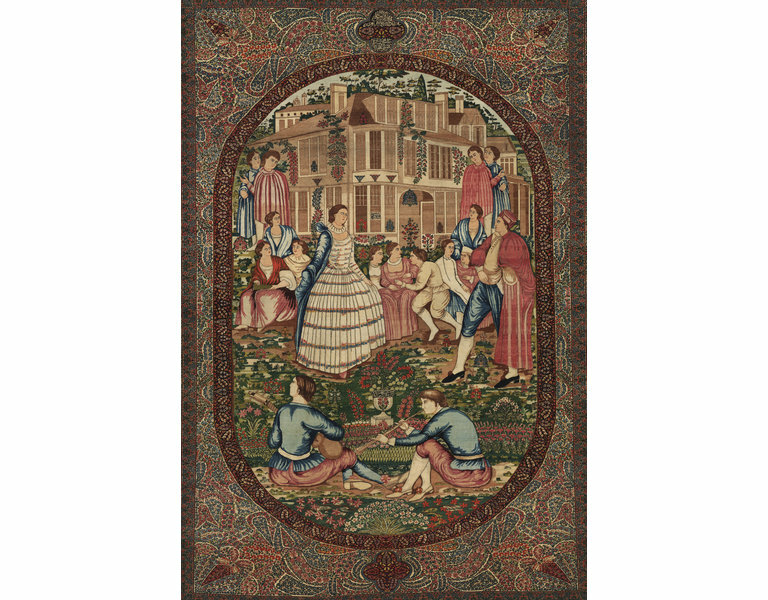 This carpet is an example of one in which the field was woven from a full-size cartoon. It was inspired by a painting by Antoine Watteau called 'Fêtes Vénitiennes' (1718-1719) which is in The National Gallery of Scotland, Edinburgh. It was woven in Kirman and is dated 1327AH (1909AD); an inscription states that it was commissioned by Abdul Husain Mirza, Governor of Kirman Province, from the workshop of Ustad Ali-yi Kirmani. Carpet, hand knotted woollen pile on cotton warp and weft, Persian, Kerman, dated 1327 AH (1909AD). Farmanfarman Abdul Husain Mirza's son visited the V&A on 8th October 2010 and explained that his father had tried to introduce European themes and decoration into the Kerman carpet workshops. 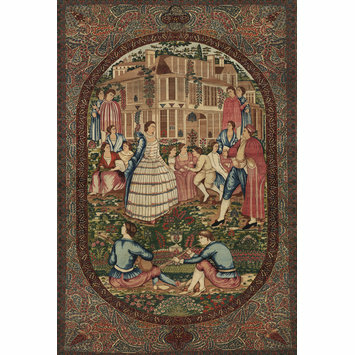 Although several carpets in this style were woven as presentation pieces, he said that the general market was uninterested and so the initiative failed. Made in Kirman; dated 1327AH (1909AD), commissioned by Farmanfarman Abdul Husain Mirza, Governor of Kirman Province, from the workshop of Ustad Ali-yi Kirmani.